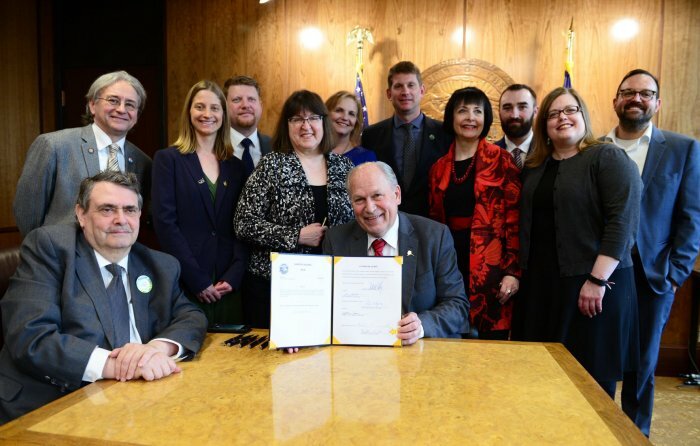 Alaska’s Governor Bill Walker signed industrial hemp legislation into law last week – with a hemp pen. As of last Friday, the plant with myriad uses was considered an agricultural crop in the state as the Act took effect immediately. As we recently mentioned in the leadup to this historic event, Senate Bill 6 will remove industrial hemp from the definition of marijuana and therefore also remove it from Alaska’s list of controlled substances. Additionally, cannabidiol will be excluded from the definition of hashish oil. “Sponsor Senator Shelley Hughes built on the work of Senator Johnny Ellis Jr. to create a great opportunity for Alaska farmers that had unanimous, bipartisan support in both the House and Senate,” said the Governor. Those wishing to cultivate will need to register and will be permitted to produce industrial hemp, which includes growing, harvesting, possessing, transporting, processing, selling, or buying it. Registered parties will also be able to use any type of propagation method and retain seeds for future crops. While like many other states, the maximum THC level (dry weight) permitted will be 0.3 percent, registered parties will be able to retain and recondition any industrial hemp that tests between 0.3 per cent and one percent THC on a dry-weight basis. Testing of crops will be paid for by the registered party. Regulations will be adopted that will specify approved sources or varieties of hemp seed to be grown, sold, or offered for sale relating to production of the crop. Production practices will also be implemented to ensure seed does not fall on non-agricultural land and isolation distances will be set to in order to maintain seed purity of strains. The full text of SB 6 can be viewed here. Reevaluating the regulation of industrial hemp under the Act will occur in seven years. On or before December 1, 2024, Alaska’s Department of Natural Resources will be required to provide a written report to the legislature on the regulation of the crop. While known more for its cold climate than sunshine and warmth, industrial hemp can grow quite well in Alaska during its summer season.